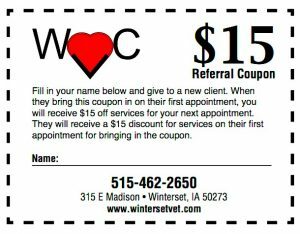 August 7, 2017, marked my tenth year at Winterset Veterinary Center(WVC). On the one hand, that seems like a long time, but as I reflect on my years here, I am amazed at how quickly the time has passed. In 2007, I had 4 children ages 7-15 at home. Now my baby is a senior and within the next year, Dan and I will be part of the “empty nest” category. Our oldest 2 children have completed their college education and are adjusting to the work world in Omaha and Chicago. Our third child just started her freshman year at our alma mater, Iowa State University, to study Global Resource System/Horticulture. These are major changes from a decade ago when I started my employment at WVC. 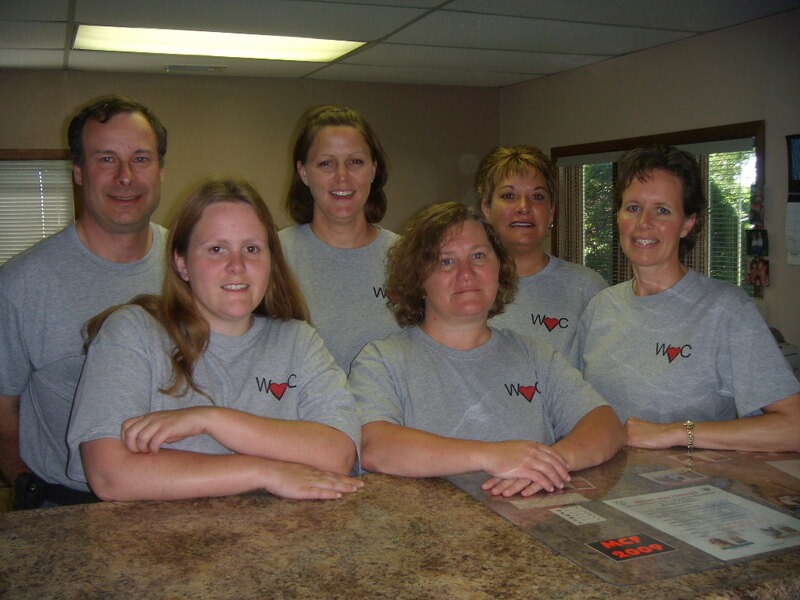 A blast from the past: the WVC staff around 2009, complete with matching t-shirts. A decade ago, there was no computer at WVC. Now, all transactions are being carried out on the computer to improve practice efficiency. The reality is we never got to a paperless practice but we certainly have a better record of purchases and medical notes. There are days that I am grateful for the computer when it works seamlessly, but over the last decade we did have one major crash that complicated our work day and made it apparent that we are helpless when the computer is down. Thank goodness for computer technicians that somehow find a way to retrieve data and get us back up and running again. 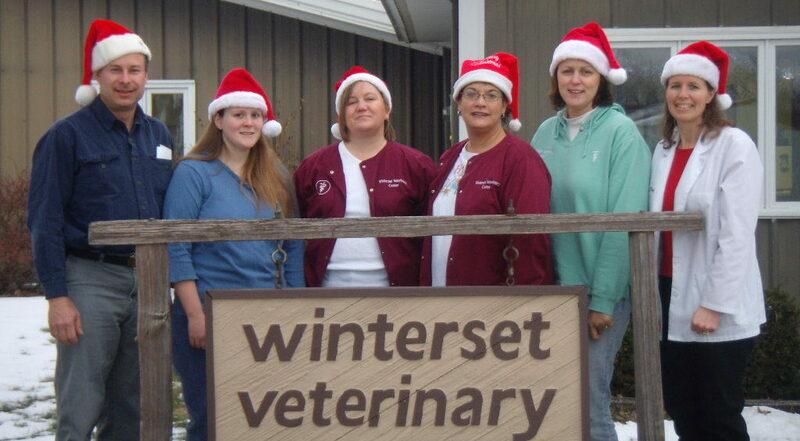 A decade ago there were 4 practices in Winterset with 6 veterinarians. Now we have 3 practices with 8 veterinarians. In the last decade we have lost some amazing veterinarians that were proud to call Winterset, Iowa, home: Dr. Gary Fisher, Dr. Craig Saveraid, Dr. Ken Henrichsen, and Dr. Robert La Follette. Each of these veterinarians had a long history of treating animals in Iowa. I think of the changes they experienced during their many years of practice. Change is a part of any profession and if one is not willing to explore new business philosophies, you cannot expect to continue to compete. A decade ago, I never heard someone diagnose their pet’s illness based on Dr. Google’s wealth of information. People never attempted to do surgeries seen on YouTube or express their grievances on social media. WVC did not have a website, Facebook page or an online store. We never placed orders for products by using a computer. We did not have a blog. We realize that many of our new customers come to us through these different sources that have only been around about a decade. Many of these social media sites are helpful to share ideas and information about our practice. We share photos of any animals brought in by the city of Winterset to try to find their owners. We share photos of interesting findings in practice. 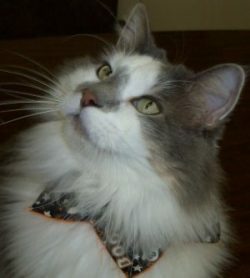 We share the blogs I write to spread awareness of things happening in Veterinary Medicine or with animals in general. Since a majority of people use their phones now to search for veterinarians and phone numbers, our advertisement in phone books is at an all time low. Will phone books be a thing of the past in the next decade? We’ve had some great times through the years! A decade ago, Dr. Jim and Stephanie were on staff at WVC when I started. Everyone else has moved on to other adventures and that opened the door for new employees to start working at the clinic. 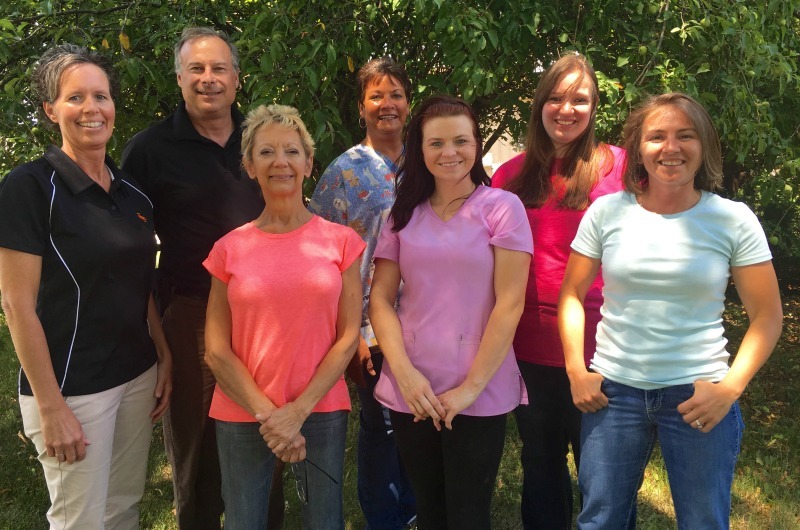 We have been blessed through these years with great staff that help the clinic thrive and grow. Mary and Kristal do an amazing job answering the phone and waiting on customers. Our groomer, Carrie, is building her clientele one perfect cut at a time. Our kennel staff, Jessica and Lexi, keep the clinic and our in house pets in tip top shape. 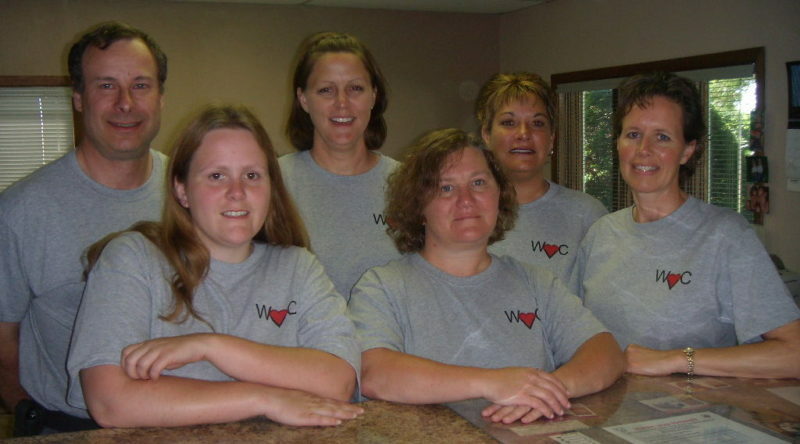 It is totally a team effort to keep WVC running smoothly. I cannot be more thankful that Dr. Ken retired right at the time I was seeking employment. The days and years have truly flown by. It can be challenging to work in a place that never has the same routine, but also prevents boredom and burnout. Each day is new and different since one never knows what will come through that door or call on that phone. A decade ago, one thing was very evident with the people who came to WVC. They all had a great need to protect their livelihood or their furbaby from harm and needed us to treat and diagnose whatever might ail them. The clients have continued to be respectful and appreciative of our services. They recognize that we cannot turn back the clock or make time stand still to escape the tough decisions that present themselves way to soon in our minds. They always show concern and compassion to these critters in their time of need. They rejoice with each new life, whether this is their first litter of puppies or their last calf of the season. We see our clients and their critters as part of the WVC family. We have rejoiced with them during happy moments and shed tears with them during the sad moments. Puppies that I watched grow up are now showing signs of age and maturity that gives me concern that to soon I will be looking into those eyes for the very last time. Yes, working at a business for a decade has the advantage of making long lasting relationships with clients. We reminisce about the past when our kids played sports together or how the kids got taller than us. We remember loved ones that were present when they first brought that puppy home years ago. We attempt to make everyone that enters through the doors of WVC know that they are important to us. Without these clients, we would no longer have a reason to exist. 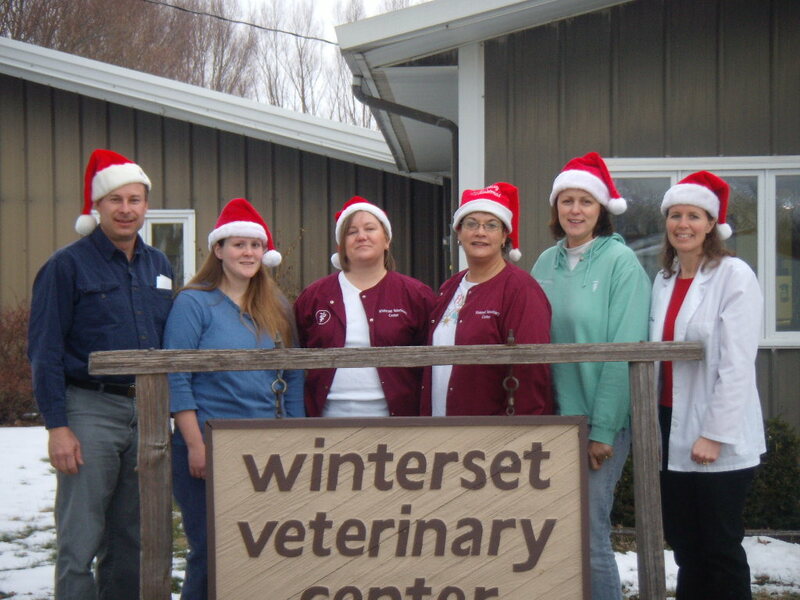 Thank you to all of our WVC clients for entrusting the care and wellbeing of your critters to us. We appreciate all of you now and in the future decades!